Setting up the latest scenario for Operation Market Garden. As usual, despite owning several hundred Kallistra hexagon tiles, some of those required for this battle are not yet in the collection. This scenario, set within Arnhem and to the north of the road bridge, requires more city hexagons than I have used in any previous game, so I had to buy a new can of “stone” spray paint from B&Q. The chances of spray painting the tiles today are slim as we are currently experiencing the first decent rain for about six months. However, I have been able to start work on the railroad crossing. My other crossings are all in the wrong direction!. 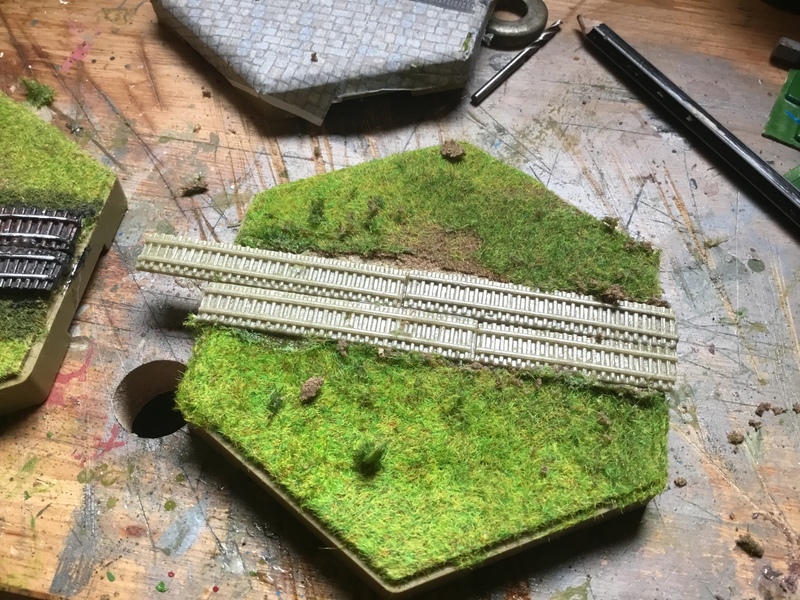 Railway sections from Leven Miniatures are glued to a Kallistra flocked hexagon tile, after wetting and scraping away the central section for the road bed. The ends will be carefully sawed off, and then a Noch roadway applied across the appropriate diagonal. Then the tile will be painted and detailed, maybe with fences and gates -we shall see what develops.